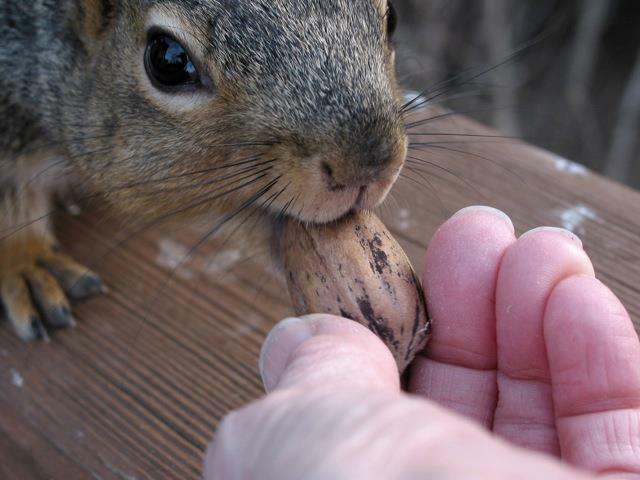 Is it OK to feed squirrels? Yes. Offer them black oil sunflower seeds or peanuts. They’ll also eat dried whole corn, on or off the cob. They’ll help themselves to about everything you put out for birds, too. This frustrates some people, but others enjoy “their” squirrels. 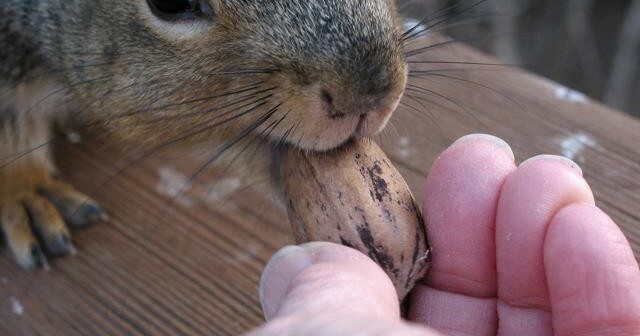 When not being fed by people, squirrels eat berries, flowers and grains, but their most important foods are the hard ones — nuts, seeds, tree bark. Not only for nutritional value, but because squirrels have four chisel-like, continuously growing front teeth that must be kept short. Gnawing on hard food keeps them filed down. Lacking that, a squirrel will die of starvation as his teeth become too long and prevent him from eating. I found a baby squirrel; what should I do? If he has hair, stay away from him for an hour, while keeping watch. If the mother is going to retrieve him, she’ll do so as soon as she’s aware. If he’s hairless, the situation is more critical, but still keep watch for several minutes. Look to see whether it’s possible to return him to his nest, although most nests are out of reach. Keep the baby warm and get him to a licensed wildlife rehabilitator right away. Don’t feed him. He’ll require a specialized diet and round-the-clock feeding. Warm a chilled baby by snuggling him in your hands. Soon as his body temperature is the same as yours, place him in a container with paper towels or a soft cloth as his “nest” materials (don’t use a material that unravels, such as a towel). Place a heating pad, set on low, under half the box. This leaves the other half unheated in case the squirrel gets too warm, but careful monitoring should keep that from happening. Don’t keep a squirrel as a pet. He’s a wild animal and belongs in the wild. In your home, he would require a very large cage, need opportunities to be active to allay boredom, will chew your furniture, woodwork and electrical wires, climb your drapes, knock over all your object d’art, and be lonesome for others of his kind. You can read more about animal rescue here. How do squirrels go down trees so easily? 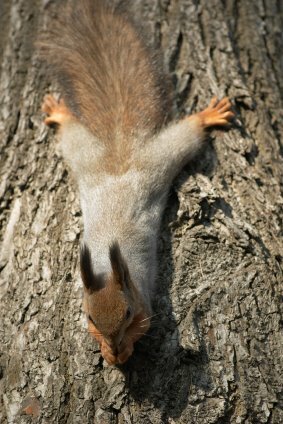 Tree squirrels can move fast and nimbly all around a tree, even headfirst going down. What keeps them from falling? It isn’t their sharp claws, although they’re important. It’s their double-jointed ankles — they can turn their back feet completely around, allowing them to cling with their sharp back claws no matter what direction they’re moving in. Yes. They’re good swimmers — they “dog paddle” with their front legs and use their tail as a rudder. But, it’s a very strenuous activity for them. If they fall into a swimming pool they often can’t find their way out and the slippery sides may prevent them from even clinging so they can rest. They eventually drown. 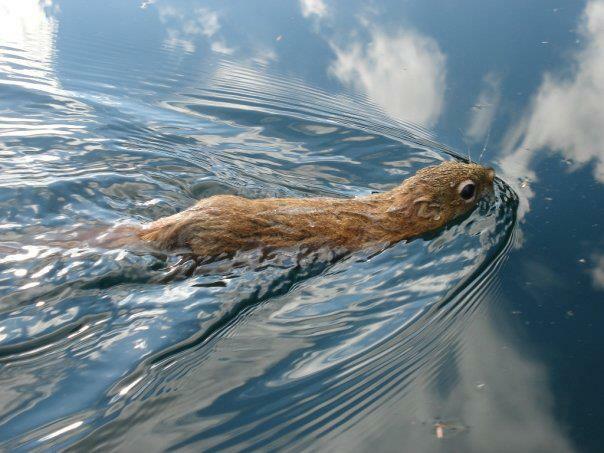 To help a squirrel get out, use a pool net to scoop him up (or any other long-handled object he can grab). Keep hold of the pole and step backward. The squirrel will run right up the handle toward you, which may alarm you. But he won’t want to have to touch you if he can avoid it and will jump off soon as he’s clear of the water. If he’s too exhausted to do more than just cling to the pole, then slowly lower it to the ground and step away. He’ll scamper off soon as he can muster the energy. Why do squirrels chew on my trees? Sometimes, they’re just hungry and strip bark to eat it. They may also gnaw on bark to “file” their teeth. Squirrels are “rodents,” a word that comes from the Latin rodere, meaning “to gnaw.” And do they ever! But that’s because they have to. 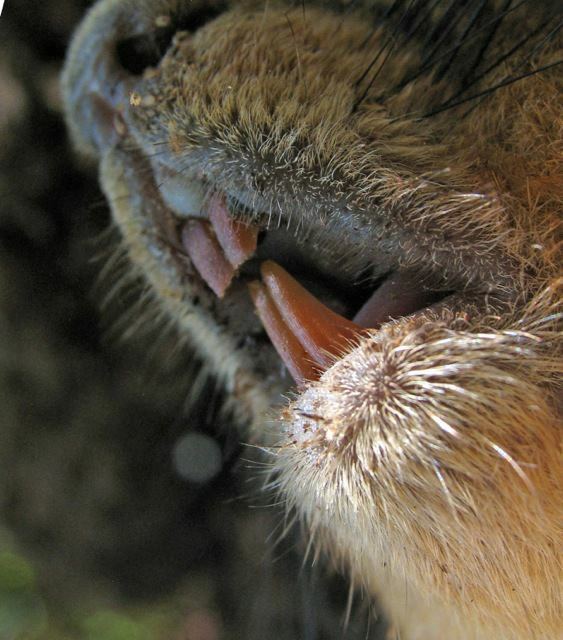 Gnawing keeps the front teeth of squirrels and other rodents short and sharp. Thick enamel covers the front surface of the front teeth (incisors), but not the back. Consequently, the back surface wears faster than the front, creating a chisel shape. They gnaw with the incisors by pushing the lower jaw forward and chew with back teeth (molars) by pulling the lower jaw backward. 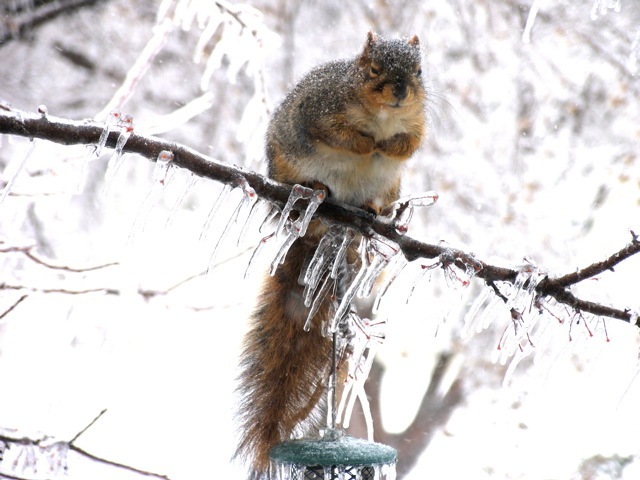 How do squirrels survive in winter? Tree squirrels prepare for winter in several ways. In the fall, they fatten up and grow a thicker coat. They bury nuts for eating through the winter. They build a good nest out of twigs, leaves, any other insulating materials they can find, preferably within a tree cavity. In the winter, when it’s really cold they may share a nest for warmth. On very bad days, they may stay in their nest.